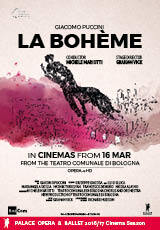 Teatro Comunale: LA BOHÈME | Movies | Palace Cinemas | Share our passion. New Production! Set in 19th century Paris, Puccini’s beloved opera charts the love a air between a poor poet Rodolfo (Sardinian tenor Francesco Demuro) and a seamstress Mimì (Italian soprano Mariangela Sicilia, who starred in this role for Opera Australia in 2017) whose relationship is tested by the cruel realities of poverty and ill health. Graham Vick’s new production is conducted by Michele Mariotti, Teatro Comunale's exciting Musical Director. Captured live from Teatro Comunale, Bologna, 24 Jan 2018.